As some of you may know, this coming Saturday I’ll be at the Llandeilo Book Fair. 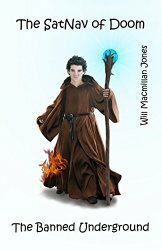 Who better to feature on the Welsh Wednesdays series today than one of the participating authors: Will MacMillan Jones. Welcome to Welsh Wednesdays and thank you for participating. First up, please tell us about your connection to Wales. Hi Christoph, thanks for inviting me along. I’ve lived in Wales for almost twenty years now, and couldn’t be happier being here. I’ve always felt drawn to this wonderful land of myth and magic (and beer) since I was a child, and living here is almost like living in a dream. Everywhere you turn are more tales, more legends; cunning and deceitful fae, witches of various persuasions, and almost every lake has a resident Lady blessed with magical powers. Oh and dragons. I’m a fantasy writer – where else in the UK could I want to live? And on a more prosaic note, family lore has it that a distant ancestor had to flee the righteous wrath of the law for sheep stealing. Don’t look at me like that, I’m a vegetarian! I’ve already confessed to being vegetarian and liking the local beers – what more do you need to know? Well, I thoroughly enjoy getting high. No, not like that. Why do people always think the worst about fantasy writers? We need to be declared a protected minority or something. I like to be on high ground, so I do a lot of walking in the fells, mountains and hills around Britain. The other year I managed to go up Snowden by mistake. It wasn’t the first time I’ve climbed the mountain of course, but I actually hadn’t meant to when I set off that day. I wanted to get some photos with a new camera, and just kept on getting a bit higher, and a bit higher; and suddenly the top was closer than the bottom so I sort of carried on… I’ve also done a lot of flying, particularly in hang gliders when I was younger. In fact (a little known fact), I was one of the first people in the UK to fly a hang glider at night. Under a bright full moon, of course. I’m not doing a lot for the reputation of fantasy writers here as sane and rational people, am I? Oh dear. 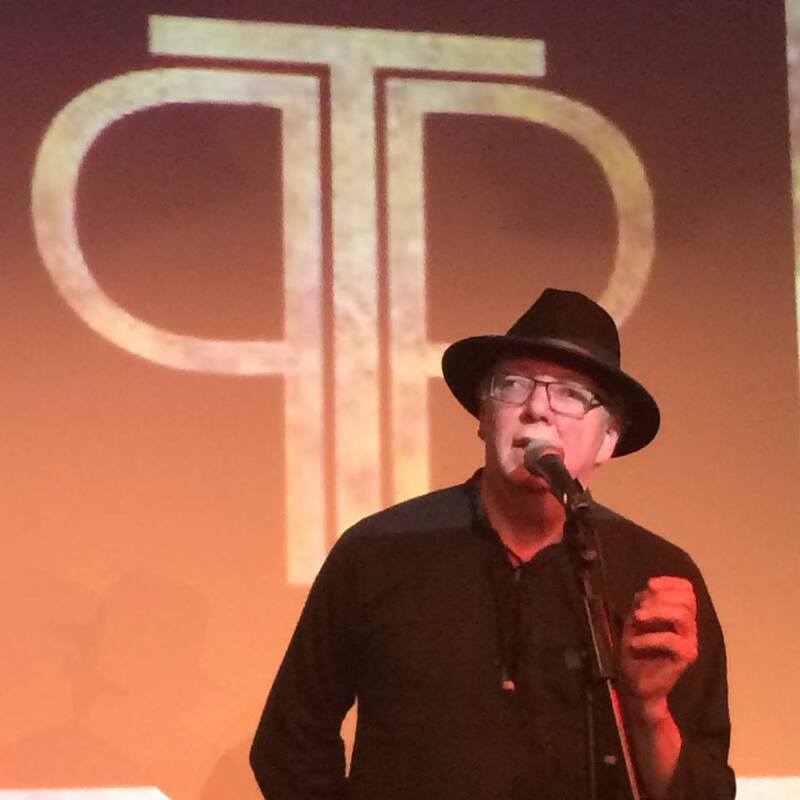 I also do quite a lot of poetry and traditional story telling as spoken word performances, which is great for the confidence. Why did you decide to write in your chosen genre(s)? Let me see: I write fantasy, horror and children’s fantasy. I once read this advice that said: ‘write what you know’. Oh dear, again. I like writing these, because most of my favourite books are in these genres. First was fantasy of course, because I revel in the complete freedom it gives a writer’s imagination to create stories. Children’s – because there are few better things to do with your time than stimulate a child’s imagination and love of books and stories, and horror because; well, I do have a dark side and I am enjoying letting it out… I do have some plans to venture into romance, but that might end up back in the horror genre if I’m not too careful. Back to writing what you know, I suppose! Tell us about the concept behind your book(s). I’m really lucky. Ideas are not an issue for me. I have around fourteen outlines for books in my moleskine notebook, and I’m always adding to them. There’s a bit of advice – always carry a notebook, and do not be afraid to use it. The idea might be rubbish, but you just never know. I do have favourite characters, a couple anyway, but I can’t even let on who they are in thought in case the others hear and complain. Or sulk. And yes, there is a character I do identify with. He’s a bit more complex than some realise, and yet – as there’s a lot of me in there too – he’s also a very simple soul. He’s on one of the book covers, which narrows it down a bit for you, but I’m not saying any more than that. Music plays a big part in my fantasy collection, The Banned Underground. 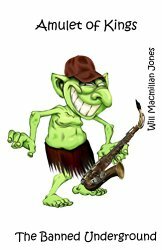 It has too, since the stories are about a rock and roll band made up of dwarfs and a jazz loving, saxophone playing, luminous green BogTroll. This of course means that I get to do my research for those novels whilst drinking in a noisy bar listening to loud music. I like to think that Hemingway and Greene would have approved of that. Best aspects: sitting all day at the desk and just making stuff up. Worst aspects: sitting all day at the desk when it is sunny and warm outside and I’d rather be walking my dog on a hill somewhere. Writing is a solitary business; we spend much of our waking time locked inside our own heads with imaginary characters yelling at us. The solitude after writing can be difficult when, as I do, you live alone. This, in all seriousness, is possibly the hardest task facing any writer today. Even the celebrity writers and the well-known authors have to market in various ways. I know of one author who won a contract with Random House for his first book, didn’t promote it well and didn’t get a contract for his second book. If we do not promote, we do not sell. That is the bald fact. Now I am actually quite a shy person (stop laughing, you at the back. I can see you.) and self promotion doesn’t come easily to me. I have to work at it. I’ve even started performing work in public now as a sort of therapy to help me overcome this issue. Social network marketing and book events like the Llandeilo book fair all help, and a writer just has to get stuck in I’m afraid. Who are your editors and how do you quality control your books? I’ve been lucky really. Ever since I first got a contract I’ve understood all about editors, what they do and why they are needed. Now that I’m a hybrid author ( some work self published, some published under contract) I’ve always maintained a small network of half a dozen trusted BETA readers and two quality professional editors. The second draft of the novel goes first to the BETA readers, then to one of the professional editors, then back to BETA readers; being tweaked a bit at each stage. It can be a long process and both dull and testing, but it is essential. My editors all like to start by going on a search and destroy mission for one of my worst errors, the humble comma. Freedom for peace-loving, persecuted commas say I. They seem to disagree, and one should always listen to one’s editor. Especially when you are paying for their time. Write. And, like the infamous moving finger, having writ move on and write some more. Stephen King, who knows a thing or two about writing, says (in On Writing) that the second million words written will be better than the first million. Can’t beat that as advice. Go write. I’m presently reading one of Joe Abercrombie’s fantasy novels in my preferred hardback format. Because I’m on a screen all day for work and writing, when I’m relaxing I much prefer to have a proper book in my hands. Joe is a leading Grimdark exponent, and since I am thinking about some slightly darker fantasy than my Banned Underground collection, I want to pick up some vibes and some tips. Criticism is something that every writer has to learn to live with. For a start, not everyone will like your subject. Kazuo Ishiguro recently wrote a novel called The Sleeping Giant and was astonished at the negative critical reaction, because it was considered a fantasy novel, for example. A writer has to grow a thick skin: and at the same time try to be alert for the simple fact that the last novel may not, in fact, be perfect and you (or more particularly, I ) could do better. And should try to do so. At the same time, some criticism can safely be ignored, and the skill is in learning to tell the difference. 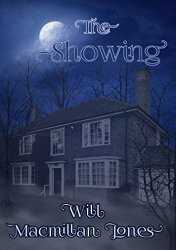 For example, one of my novels has a negative review on Amazon which reads: ‘Not read. Not well.’ By which I assume the reviewer couldn’t think of anything about the book they liked, as they had not opened it owing to an illness. Quite what anyone is supposed to make of that review, I’m not sure. Hi Christoph. It’s nice to meet Will, especially since I can’t be at the book fair. I got a kick out of the “high” comment. Many people, having read some of my stories wise-crack wanting to know how much acid i’ve done. But my wiring is just naturally that wacky. Hugs all around.